Looking for something fun and unique for a party, office, or lobby? Wow everyone with this gorgeous fresh flower arrangement! 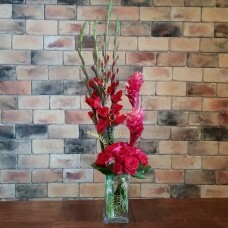 The vivid red roses, gladiolas, and lobster claw heliconias invoke class, romance, and intrigue. The added accents of gold curly metal pieces add a lighthearted vibe that also serve as a beautiful contrast to the reds. The vibrant reds will catch hearts on fire! Substitutions may be needed according to season and stock. We will still capture the magic!.